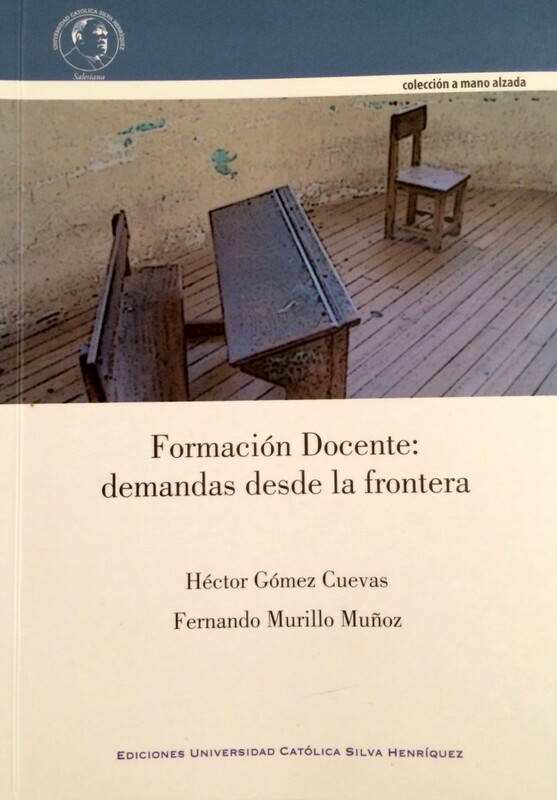 Gómez and Murillo will discuss their new book Formacion docente: demandas desde la frontera [Teacher Education: Demands from the Boundaries], a collection of essays that gives voice to perspectives and approaches frequently absent from traditional practices, but are fundamental to the transformative possibilities of teacher education. The essays are situated within a postcolonial perspective in dialogue with queer theory, inviting a rethinking of current discursive practices around the curriculum of teacher education, asking – among other things – Where do these discourses and practices come from? What gives them legitimacy?, What effects do they have? as a way to problematize the ways in which the curriculum of teacher education is responsible of signifying, appropriating and reproducing identitarian configurations, as well as problematize ways of thinking that discipline and configure certain modalities of life projects through their formative action. Héctor Gómez: Bachelor in Education – Teacher of History and Social Sciences, Master of Arts in Education and Curriculum. Professor and researcher at the Faculty of Education of Universidad Católica Silva Henríquez. Head of the Curriculum Unit at Universidad Católica Silva Henríquez in Santiago, Chile. 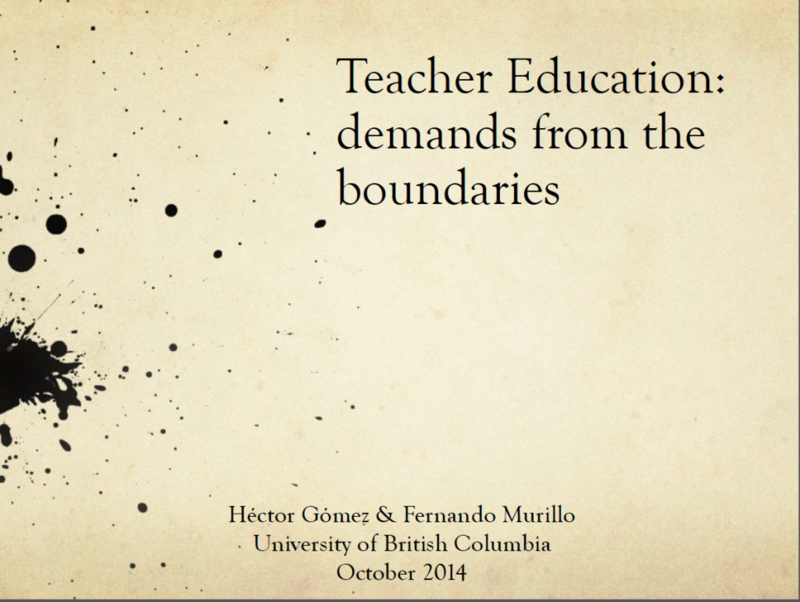 Fernando Murillo: Bachelor in Education – Teacher of English as a Foreign Language, Master of Arts in Education and Curriculum, UBC PhD student. Former curriculum advisor and policy maker for the Ministry of Interior, Government of Chile. Professor and curriculum advisor at Faculty of Philosophy and Humanities, Universidad Alberto Hurtado and Universidad Católica Silva Henríquez in Santiago, Chile. The news cycle for the “BC Ministry of Education official commissions a $16,000 education report from a 19-year-old high school graduate he met at a wedding” got extended one more day, catching the attention of folks at the centre of the universe. Today’s National Post ran a story by Tristin Hopper, “B.C.’s ‘superintendent of achievement’ under fire for commissioning $16K education report from 19-year-old he met at wedding.” Hopper’s piece is a good overview of the imbroglio. And, if you haven’t read Vyas’ final report, Hopper offers an accurate analysis of it and adds commentary from Jonathan Dyck, a teacher at B.C.’s Langley Education Centre, and yours truly. The National Post article caught the attention of the folks at CBC Radio and as a result I did a short interview with Carol Off on “As It Happens” this afternoon. You can listen to a podcast of the show here, my bits start just after the 15:00 mark, but you should listen to the entire show because there are some wonderful clips, stories, and quotes from and about Farley Mowat throughout; and they close this episode with Ronnie Hawkin’s “Mary Lou”. 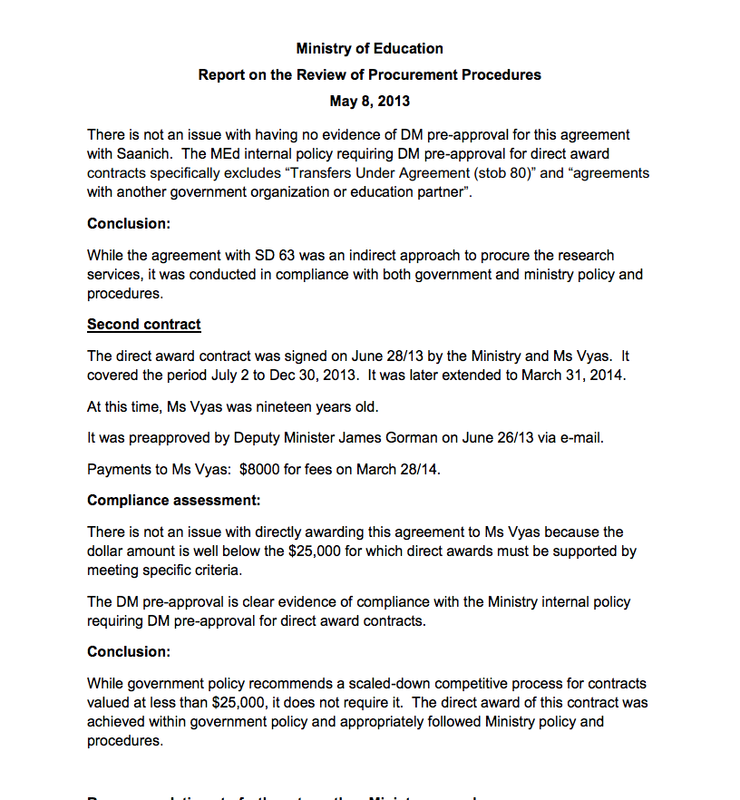 The British Columbia Minister of Education has announced an investigation into the research contracts that funded a teenager’s “study” of teacher education programs at the University of Victoria and University of Helsinki. 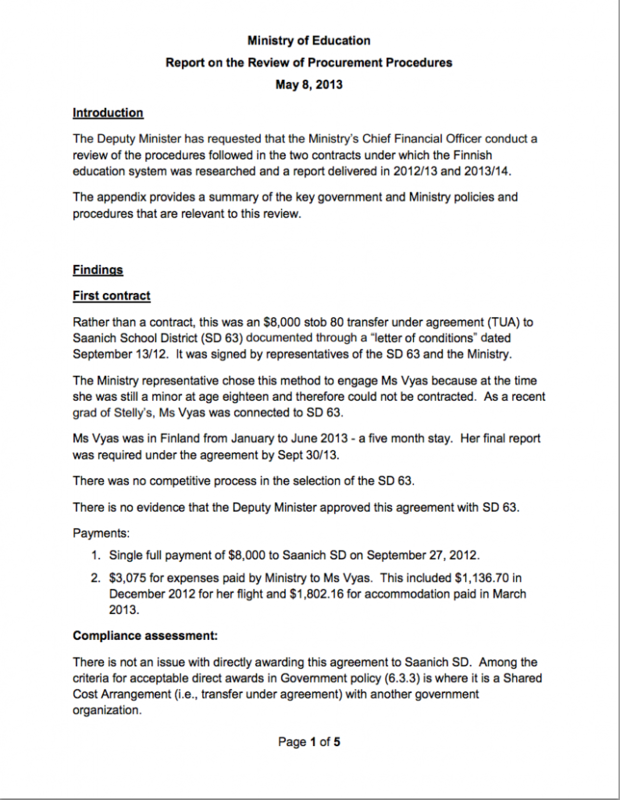 This story has been floating around since last fall, but the Ministry has had nothing to say about these sole-source research contracts until the Canadian Taxpayers Federation of BC obtained and published the final report. A story by Times Colonist reporter Amy Smart about the research contracts and the student’s report, was also a big nudge (see below). I’m doubtful we’ll get any real insights into this bizarre episode, at least in the short term, because Education Minister Peter Fassbender indicated that the investigation would focus on contract “procedures” rather than substance of the decision making process. Rick Davis, the Ministry’s “superintendent of achievement,” is the official who gave the contracts to Anjali Vyas, who at the time was a recent high school grad and deejay, she is now an undergraduate student at UBC. Can there be a rational explanation for funding a high school grad to travel to Finland to study teacher education? I’m interested to know what it was Rick Davis and the BC Ministry of Education were expecting? Did they really believe that funding a 10 month “study” of teacher education conducted by a recent high school grad would produce insights into the professional preparation of teachers? Education Minister Peter Fassbender says he is investigating how $16,000 in public funds were paid to a teenage researcher on the already well-researched topic of Finnish teacher education. Stelly’s Secondary School graduate Anjaly Vyas travelled to Finland in 2013 to interview students about teacher education. She also interviewed students at the University of Victoria and wrote a 14-page report of her findings. Superintendent of achievement Rick Davis signed two contracts for her work — one in 2012 for $8,000 and another in 2013 for “up to $8,000.” In documents obtained by the Canadian Taxpayers Federation through a freedom of information request, he said Vyas offered “student eyes” on teacher education. “I think this young lady, of course, was passionate about education and I really celebrate her enthusiasm. But this isn’t really about her, it’s about our procedures,” Fassbender said Tuesday. Fassbender said the contracts are concerning, but also called the awarding process “open and transparent,” since all ministry contracts are posted monthly. Sole-source contracts under a certain threshold can be awarded without contest, but they are traditionally signed off by the deputy minister, he said. “The current deputy was not the one who signed this particular contract, that’s why we’re reviewing it,” Fassbender said. James Gorman was deputy education minister from 2008 to October 2013, when Rob Wood replaced him. Earlier in the day Amy Smart reported the story in The Province newspaper: B.C. blasted for paying teen $1,122 per page for report on teacher education in Finland, to which Jordan Bateman of the Canadian Taxpayers Federation and I contributed commentary. The CTF filed the Freedom of Information requests that produced 115 pages of background documents and the Vyas report. “There’s a difference between gleaning student input and spending $16,000 to send a 19-year-old to Finland on very flimsy pretenses,” he said. The ministry didn’t get much for its money, Bateman said. At 14 pages, the “thin” student paper released Monday essentially cost taxpayers $1,122.81 per page. The first $8,000 contract was signed in 2012, while a second one for “up to $8,000” was signed in 2013. Bateman filed a freedom of information request after reading a story in the Vancouver Sun celebrating Vyas’s achievements. In the story, she said she met Davis when she was DJ-ing at a wedding. Davis met Vyas “coincidentally” at her teacher Gord Ritchie’s wedding, the ministry said. But Ritchie had already alerted Davis to Vyas’s research interests and they later arranged a formal meeting. I told Smart that while Vyas seemed “very bright and motivated,” the project was an insult to education professionals. Vyas apparently didn’t respond to reporters’ requests for interviews, but she submitted a video statement to CBC News Vancouver defending her project. I agree with Minister Fassbender that Vyas and her work should not be the primary focus here. As I mentioned in previous posts, I’m not interested in picking apart the report or making judgments about her work. That’s really beside the point. What is at issue is the agenda of the Ministry. Why create a situation any thoughtful person could easily predict had the potential to blow up in the faces of everyone involved? Rick Davis and the Ministry are responsible for putting Vyas in an awkward position. Vyas shouldn’t be a scapegoat. And, Davis and the Ministry should be held accountable, not just for the money spent, but the process and product of government decision-making as well as their frivolous approach to teacher education. When is Davis going to step up and offer a defence of his actions? The one thing he could really learn from Vyas is having the courage to defend his own work. Would that be worth $16,000.00? BC’s teacher surplus, is it more than a math problem? In today’s issue of The Province, columnist Michael Smyth drops some startling numbers about teacher supply in British Columbia (“Let’s all do the math on BC’s teacher surplus”). There’s no doubt it’s tough for new teachers to find full time positions in the province, it’s tough to even get regular work as a teacher-on-call (TOC) in some districts. I know this from personal experience as professor in UBC’s teacher education and because the guy who cuts my hair received his BEd from UBC four years ago. number of full-time-equivalent teachers in the public school system: 30,101. Of course, as Smyth points out, some of the folks in the first group are not in the public school classroom, but are employed educators, either as administrators in public schools or as teachers in independent schools, etc. Anyway you cut it, there is a oversupply of credentialed teachers in relation to available jobs in BC. This is circumstance BC educators and teachers educators have been aware of for many years, even as provincial universities have continued to graduate about twice as many BEds per year as there are province-wide vacancies (about 1,800 teacher education grads per year for about 900 teaching vacancies per year). In 1999, there were 5,000 active TOCs and a British Columbia Teachers’ Federation survey indicated that on average TOCs work worked about 73 days per year (40% of the school year) and earned about $11,000.00 per year (20% of average teacher salary). That’s a fair question, but then again, if we’re looking to the good old invisible hand of the market to provide us with some explanations, how does one explain the fact that BEd students keep flowing into teacher education programs when job prospects are so bleak? One one hand we could argue that Adam Smith’s metaphor for a self-regulating marketplace is not all it’s crack up to be, but more important is the fact is that many people are highly motivated to become teachers. When I graduated with an education degree in 1978, the job market for teachers was similarly poor. I worked as a substitute teacher, went to grad school, and ultimately had to move hundreds of miles away from home for my first full time classroom position. Symth says that it’s “insane” for BC universities to train teachers the province doesn’t need, but another way looking at what’s happening is that provincial universities are (and have been) merely responding to a market demand for teacher education programs. Remember, post-secondary education in BC has been subjected to a steady stream of neoliberal economic policies from the governing BC Liberals, which has marketized every area of the public sector. Do we need to allow for more “self-regulating behaviour of the marketplace” or do we need a centralized “five year plan” for the teacher labour market? As usual that kind of dualist thinking doesn’t help much because reality is much more complex. About six years ago the Faculty of Education at UBC embarked on a remake of it’s teacher education program, using the title CREATE (Community to Reimagine Educational Alternatives for Teacher Education). The “new” teacher education program has been in place over year now, and while there have been changes within the program, its basic structure and length look quite familiar. There are topical cohort programs with specialized emphases (e.g., arts-based; problem-based learning; IB, etc. ), various streams for practica, but it remains, for the most part, a one-size-fits all model (post-baccalaureate, 12 month BEd program, with a 2 year option for elementary teachers). At the beginning of the UBC CREATE endeavour (circa 2006), the social studies education faculty proffered what amounted to a “Finland option,” which was motivated in significant ways by the oversupply of socials teachers (as well as the increased number of part-time sessional instructors in the program). In short, we outlined a program where preservice social studies teachers would earn a masters degree, emphasizing advanced coursework in history or geography along with education courses necessary for an initial teaching license (essentially what is known in the US as a Master of Arts in Teaching program). At the time we had five full time faculty members ready and willing to put together a world class program working in collaboration with other departments; the numbers of students in social studies education would have been drastically reduced, and standards increased. This proposal was apparently too creative and was given no serious consideration. Other proposals that would have dramatically re-structured the UBC approach to teacher education, such as adopting a 4-year undergraduate teacher education program, were also rejected. Curriculum change in universities is a deliberate process to say the least, but I think this case illustrates what happens when the bottom-line rules. To say that the UBC budget is opaque is an understatement. Whether we’re dealing with the “historical budgeting” approach of the past or the decentralized budgeting of the present, budget messages to faculty are always muddled, muddy, mystifying and obfuscated. UBC always facing cuts on the academic side. But there’s more to the story. We can’t contemplate improving the quality teacher education programs without also considering the financial contexts internal and external to the university. When it comes to program form and content there are the sometimes competing interests of government regulation in teaching profession, views from the profession itself, and from scholars of teaching and teacher education. And to complicate matters university faculty have less and less control over the academic content of courses and programs, with the demise of shared governance and university administrators increasing desire to commodify learning (see UBC’s Policy 81, for example). Ten years ago the UBC teacher education enrolment was in the 800 per year range. Last year there were 935 applicants to the program and 632 were admitted. Does that mean we’re headed in the right direction?